Poncha is a typical Madeiran alcoholic cocktail. You find it in most bars and cafés and is mostly prepared fresh on demand. 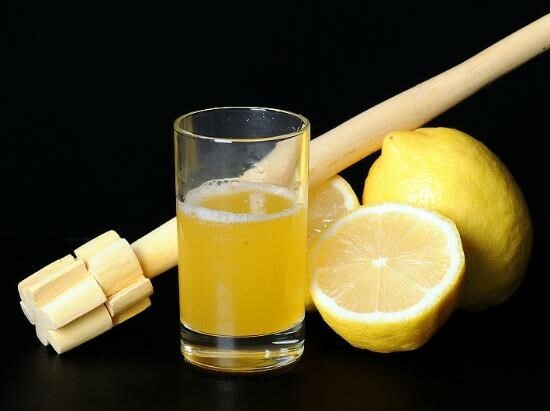 The ingredients are lemon, honey and aguardente de cana – sugar cane alcohol. The beverage is highly alcoholic but drinks easily like juice which can be problematic. Hence we advise drinking it slowly and with moderation. The taste is sweet and without a strong alcohol taste. So you might want to sip carefully, since this sweet drink has a kick to it. Aguardente literally translates as fire water and is a strong alcoholic beverage obtained through the fermentation and then distillation of sugar cane juice. All ingredients mix together with a mexelote, a wooden mixing stick more commonly called caralhinho. Nowadays, Madeirans prepare poncha with many different fruits found on the island. 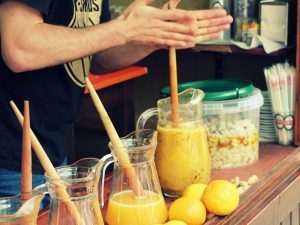 You can find poncha with oranges, passion fruit, grapefruit, mint, cherry or others. Then it is up to you to vary the quantities and add the juices of various fruits you have at hand to suit your taste. Poncha’s roots are thought to be in Camara de Lobos. The fishermen used to drink it before going out to sea to kill germs and other diseases. It does sound a bit like a grog or rum toddy used by our grandmothers against colds, sore throats and the flu. Don’t you think? The famous Brazilian caipirinha is said to have evolved from Madeira’s poncha. • A hot spot is the “Taberna da Poncha” in Serra de Agua. Be careful if you have peanut allergies. Customers drink the brew while munching on peanuts and the shells are simply crushed on the floor.